The most immediate concrete change the Tax Cuts and Jobs Act (TCJA) will bring about for employers is new payroll tax withholding rates. 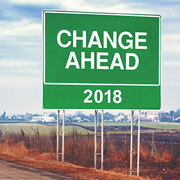 Here's the latest word from the IRS: "We anticipate issuing the initial withholding guidance in January reflecting the new legislation, which would allow taxpayers to begin seeing the benefits of the change as early as February. The IRS will be working closely with the nation's payroll and tax professional community during this process." In general, a taxpayer generally is allowed a deduction for ordinary and necessary expenses paid or incurred in carrying on a trade or business. However, among other exceptions, there's no deduction for: illegal bribes, illegal kickbacks or other illegal payments; certain lobbying and political expenses; fines or similar penalties paid to a government for the violation of any law; and two-thirds of treble damage payments under the antitrust laws. To receive a general business tax credit in 2018 and 2019, employers must grant full-time employees a minimum of two weeks of annual family and medical leave during which they receive at least half of their normal wages. Ordinary paid leave that employees are already entitled to, such as vacation or personal leave, or any form of leave already required by state and local laws, doesn't qualify for the tax credit. The minimum credit equals 12.5% of the eligible employee's wages paid during that leave, up to a maximum of 25%. Within that range, the amount of the credit rises as employees are paid more than the minimum of half their normal compensation during their leave period. Employers that qualify may claim the tax credit for a maximum of 12 days per year of family and medical leave. While most authors of the TCJA are probably hoping employees who will see a higher paycheck will use the difference to stimulate the economy by spending it immediately, there's another scenario employers might consider: Employers that are concerned their employees aren't saving enough for retirement could suggest that some might elect to "bank" their tax cut "raise" in the form of an increased 401(k) contribution. It's also noteworthy that early versions of the TCJA would have drastically reduced employee opportunities to save for retirement in a 401(k) using pre-tax dollars. One proposal that would've hit many taxpayers hard would have limited contributions by requiring them to combine participation in multiple plans, including mandatory employee contributions to defined benefit pensions. Under the new law, former employees in that situation have until the due date of their tax returns to move funds equal to the outstanding loan balances into IRAs without penalty. The same opportunity would apply if they were unable to repay their loans due to their plans' termination. "Tangible" achievement awards still qualify, but the following award categories are no longer considered tangible: cash and cash equivalents, gift cards, gift coupons, gift certificates, vacations, meals, lodging, tickets to theater or sporting events, stocks and bonds. Another section of the law alters the inflation index used to periodically adjust the limits on contributions to health flexible spending accounts, health savings accounts, and the threshold for the value of health benefits subject to the 40% "Cadillac tax" (currently scheduled to take effect in 2022). Instead of using the regular consumer price index (also known as the CPI-U), annual limit adjustments will be set using the "chained CPI-U." That "chained" version tends to rise at a slower rate than the unchained index. The same formula change was made applicable to IRA contribution limits. When you add it all up, many employers and employees are likely to be happy with the overall effects of the TCJA. The task of digesting all the changes might cause a few headaches in the short run, however. If you have any questions on the new tax reform provisions, contact us.